Amazon.com description: Product Description: The crust, the texture, the aroma, the taste -- a hearty whole grain bread makes the meal or, in the case of the cheese breads, blinis, or calzone that Beatrice Ojakangas serves up, becomes the meal. The seasoned baker and the passionate amateur, the connoisseur and the simply famished will find plenty to celebrate in Ojakangas's classic bread-making book. Whether it's traditional Finnish rye, old-fashioned corn bread, scones, croissants, pretzels, or popovers, the perfect bread for any occasion can be found in this book, along with companionable advice for making it perfectly every time. For the baker with no time to spare, Ojakangas includes a large assortment of fast and easy breads. 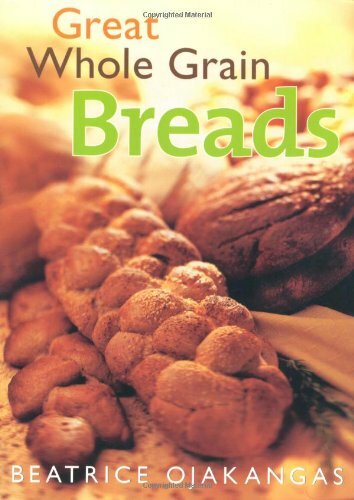 With more than 250 sweet-and-savory recipes, easy-to-follow, step-by-step techniques for mixing and kneading, and special hints for working with whole grains, Great Whole Grain Breads should find a place in every baker's kitchen.